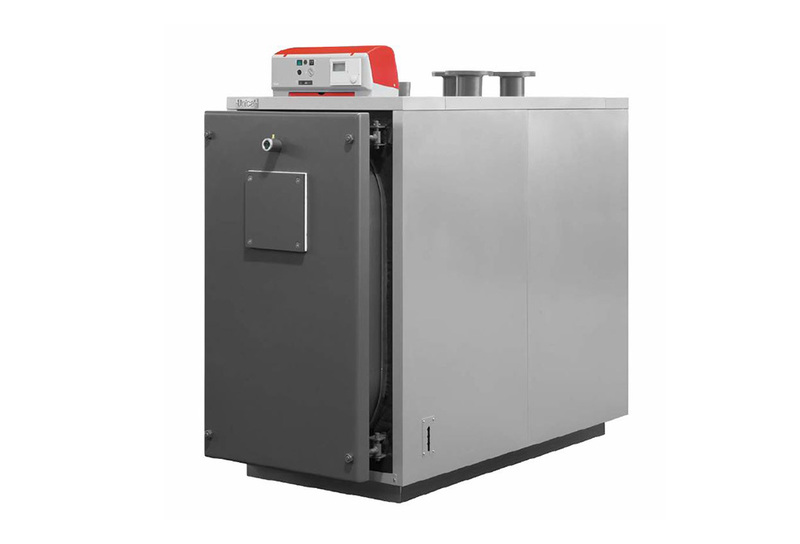 Oil Condensing Boiler – The Flexiheat XCK Oil Condensing Boiler is a product of high specification, extensive research and long accumulated experience. The design and its whole construction are a combination of knowledge and experience on our stainless steel condensing oil boilers. The XCK series is at the leading edge of the newest concepts of boiler manufacturing with all internal parts being made of Stainless Steel.A total output of 12,000 kW or 12 Mega Watts can be achieved when using these condensing oil boilers in a cascade configuration. New generation condensing boilers are also called hi-efficiency boilers, because they have been designed and produced thanks to a great technological advancement. Condensing boilers’ principle is based on the exploiting of the heat from exhaust gases through technical solutions taking residual heat and transferring it to cold water entering the boiler. The process seems quite easy, however there is more heat to be exploited: emissions latent heat in the vapour produced during combustion, which is 11%. 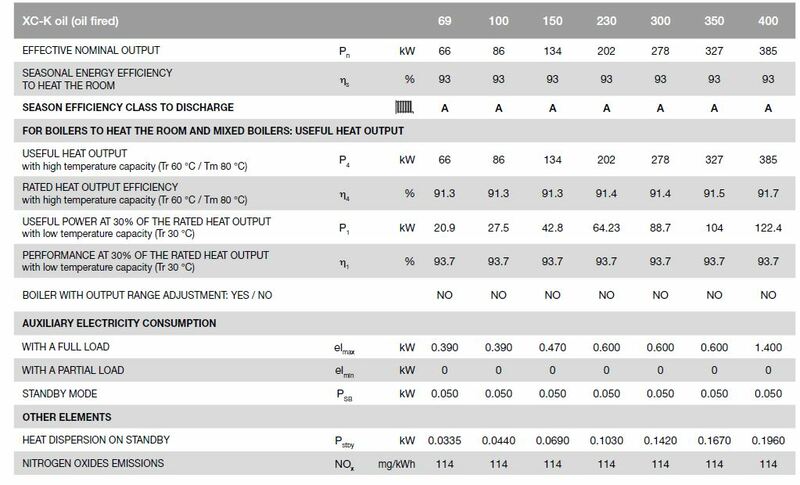 With traditional boilers, potential energy on emission gases cannot be recovered and is dismissed in the environment, because the emissions are ejected at temperatures higher than 120°C; on the contrary the condensing boiler principle allows heat recovery from emissions, by cooling them below their dew point, and exhausting them below 65°C.In this way it is possible to recover the latent heat by the heat exchanger within the boiler, dissipating colder emissions in the atmosphere (50-60°C compared to 120-180°C in a current non-condensing oil boiler) thus respecting the environment. 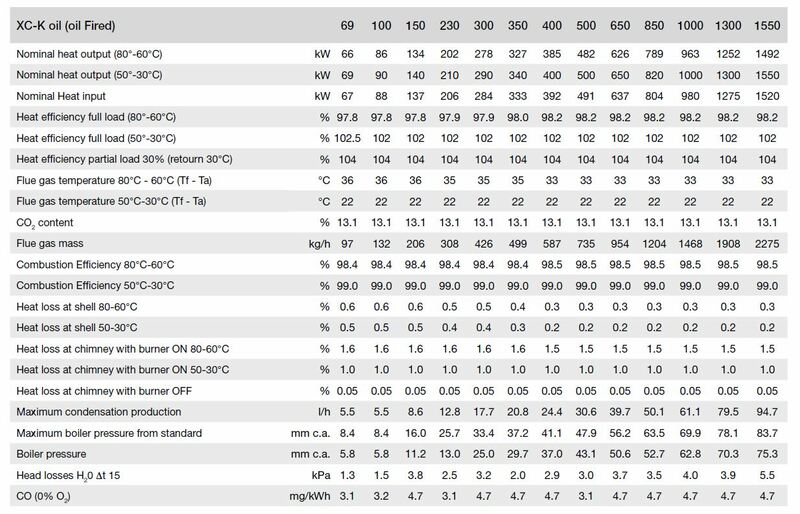 Thanks to Lower Heating Value (LHV) definition which does not include latent heat, so that condensing boiler efficiency exceeds 100% and they have about 25% higher annual efficiency than traditional boilers. 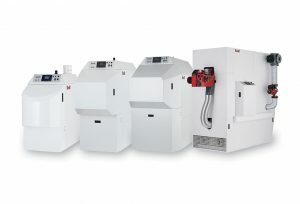 As to Standard EN 303-1 the Flexiheat XC-K Commercial Oil Condensing Boilers are intended for water heating (up to 100°C), for central heating installations, as well as for other similar use. The maximum operating pressure allowed is 6 Bar. – Three passes of the burned gases. The door of XCK boiler opens to the left or to the right, so that there is easy access to the combustion chamber for cleaning and is also equipped with a PYREX covered hole for easy visual inspection of the flame during operation. The smoke chamber cover is fastened with screws and has a special cleaning opening, which also acts as expansion opening. The XCK high efficiency oil boilers are accompanied by a control panel, which is equipped with all the necessary instruments and functions. The control panel includes: general switch, safety thermostat, burner thermostat, water pump thermostat, and thermometer and operation lamps. There is also provision for additional installation of all automatizations of a modern boiler facility for automatic function and energy saving. XCK Oil Fired Condensing boilers operate with heating oil, in accordance to DIN 51603, with natural gas, or liquid gas according to specifications DVGW of Germany and DIN 4788. 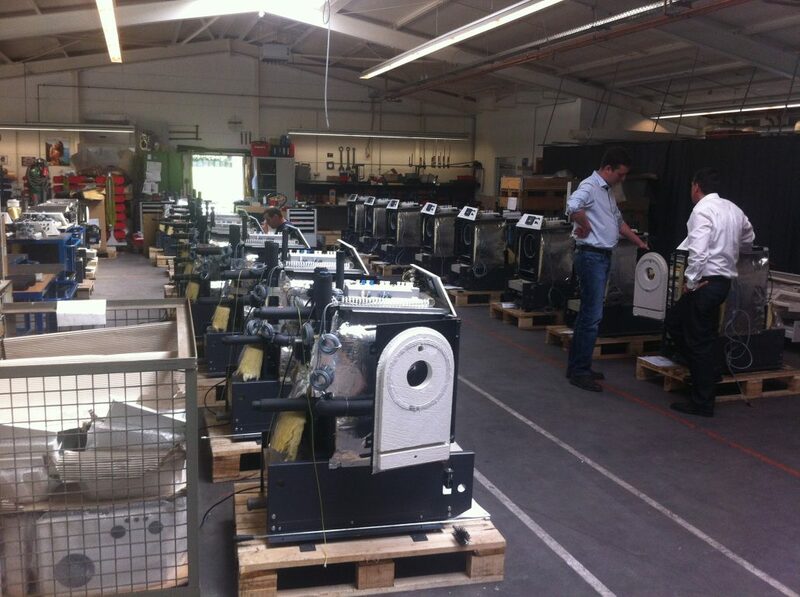 Our oil boilers are manufactured following the German specification DIN 4702. The manufacturing process is based on the European Norm DIN EN ISO 9001, as to the equipment, the manufacture and the control of sub-assemblies, as well as to specialized personnel and the design. The XCK Condensing Oil Boilers have the CE approvals and quality mark. 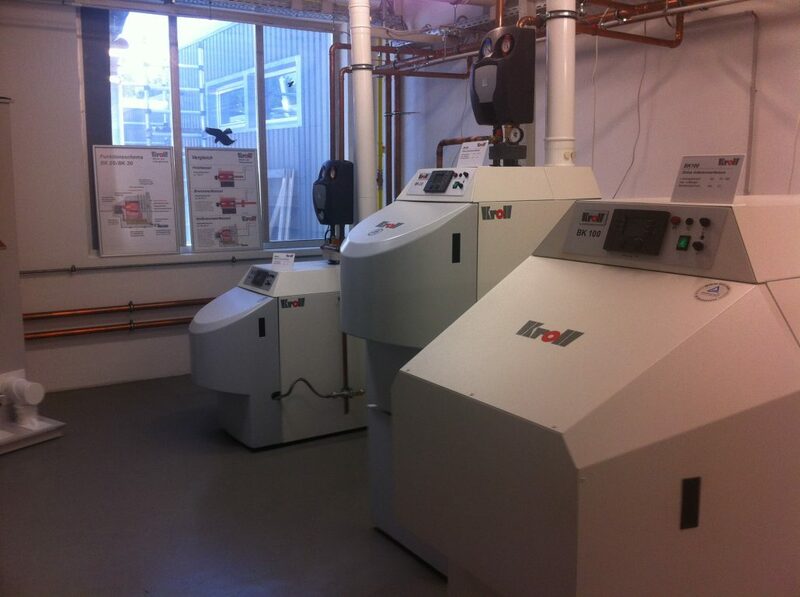 Oil Condensing Boiler – Permanent Condensing Operation – Even at high temperatures of 82/71°C or 80/60°C, the boiler is still permanently condensing.No matter what the temperature of heating system, these condensing oil fired boilers work all of the time. Room Sealed – As the unit is room sealed, no additional combustion air is required. This contributes to a positive energy balance of the building. Flue System – Due to the low flue gas temperatures,plastic flue pipes can be utilized, saving on installation costs. Fuel – The Kroll range of oil condensing boilers are available in oil , specifically kerosene or gas oil. The secondary heat exchanger and the neutralization appliance have been engineered to resist the high sulphur content associated with burning oil. The boiler body is made of high-performance steel with cylindrical reversal combustion chamber and round flue gas passes. Due to the boiler’s construction, the flue gas is cooled down to about 60°C – 80°C already inside the boiler body where it transfers the major part of its heat to the boiler water, before it enters the plastic heat exchanger. The boiler body stays dry due to the integrated return temperature lifting. This has got a positive effect on cleaning the boiler, as the residues can be removed very easily and quickly. The integrated heat exchanger, in which the condensation takes place, is made of a special type of plastic and thus resistant against acid sulphur (sulphur dioxide + water). Therefore, no sulphur-free heating oil is needed. Furthermore, the heat transfer is exclusively done in a counter flow with air/flue gas. So there is no pollution nor blocking nor rusting through of the heat exchanger due to the heating water. Due to the permanent condensation, the secondary heat exchanger practically cleans itself. Should the plastic heat exchanger become polluted due to wrong or bad burner settings, it can be cleaned very easily with water. The flue gas is washed out by the permanent condensation. The environmentally harmful acid sulphur is neutralized in the neutralization box and is lead into the canalization, now pH-free. So, only “water vapour” is emitted into the atmosphere, with no sulphur dioxide. This is a very environmentally friendly. The integrated modulating flue gas fan adapts the combustion chamber pressure to the weather conditions. This gives constant combustion conditions, independent from draught or pressure in the chimney. These oil condensing boilers / commercial oil boilers , are perfect for retro fitting , in existing heating systems that were designed on an 82C Flow / 71C Return temperature , as most of the oil condensing boilers on the market would require the return temperature to be above 43C . This is not required with our oil condensing boiler , as we save the energy by preheating the incoming combustion air to the burner . which is independent of the return temp. Thus you would not need to change your existing pipework or heat emitters , such as radiators , fan coils, unit heaters etc , to compensate for the new flow and return temperatures, that would be required. Since the 2015 ErP ( Energy Related Products Directive ) Heating Classifications that came into force on the 26th September 2015 , all boilers up to 400 kW have to meet new efficiency levels. which basically means all commercial oil boilers , up to 400 kW , are now condensing. This not only benefits the end-user , it means reduced emissions and significant savings in energy. We reports from some of our customers that they have seen oil consumption savings of up to 35% by upgrading to an Oil Condensing Boiler.